On October 2, 2009, UNESCO designated Indonesian batik as a Masterpiece of Oral and Intangible Heritage of Humanity. The education, science and cultural organization of United Nations insisted that Indonesia preserves their batik heritage. Of course! I can’t see otherwise. Batik has long been Indonesian traditional clothes, since the kingdoms era. Though, I cannot just ignore the fact that batik or fabrics that have batik patterns are found also in Malaysia, Singapore, Japan, China, Azerbaijan, India, Sri Lanka, Egypt, even in African countries like Nigeria and Senegal. But in Indonesia, you will see batik as everyday life part of some people. Each region here has their own batik’s unique patterns. Relating to things in their daily life, which show up in the patterns design of nature, animals, flowers, human, folklore, and others. The culture always also influences the design. Batik from coastal cities of northern Java, for instance, has particularly vibrant color. It absorbs Javanese, Arabian, Chinese and Dutch cultures. You can say, batik is an ancient method of color dyeing. But actually, there is stamp batik and hand-made batik (called batik tulis). Making the second one is never easy. It involves a complex process with many hours of hard work. For giving you a big picture, this is how to make batik at a glance. First, you may design the pattern on the fabric. Second, ink that pattern with melting wax using canting. The canting is some kind of pen for making dots and lines on the fabric. It is roughly as big as a smoke pipe. The wax itself acts like a barrier to the color dyes and allows the color to stay while the remaining non-waxed fabric absorbs the dye. The wax is then removed by soaking the fabric in hot water. Then, you have to repeat the process of dyeing and waxing. Wax can be removed and re-applied several times to make classy and intricate design. Don’t have patient about that? No problem. You can just buy batik in stores (or online stores) anytime. The price is various. Each piece of batik shirt, blouse or skirt is worth from tens of thousands until tens of millions IDR. People give value for batik regarding its quality of design and fabric. Wah, kalo batik mobil gitu, ngerawatnya gimana, ya? Di Hajarabis ada batik2 keren, nggak? 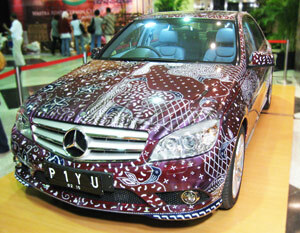 @Aleena: Merawat batik mobil? Ya sama. Nyucinya jangan pakai mesin, harus pakai sabun khusus, jangan diseterika langsung, hehehe…. I haven’t tried these products, but I will be looking for them. We use lots of frozen veggies, meats, desserts. Anything that can get us a step closer to offering a healthy meal for our family of 5 (two of whom are 2 year old twins who can be picky somedays…). Probably a special frozen favorite is shrimp. Our 6 year old LOVES shrimp. So do we. Enjoy your blog… and watching another set of PK twins. Blessings! Warisan budaya serta aset budaya indonesia sungguh menakjubkan..